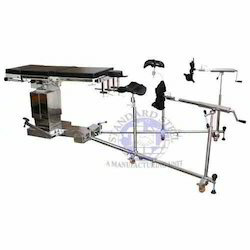 Leading Exporter of orthopedic table, hydraulic ot table and electric c arm ot table from Ambala. Our Hydraulic C ARM Orthopedic OT Table is provided with oil valve that ensures easy movement of hydraulic pump. The tables are also equipped with radio translucent hand board and hand traction device. Sturdy and durable, our tables are easy to maintain and are therefore highly demanded in the market. Our domain expertise enables us to manufacture a wide range of Hydraulic OT Tables, which is used in hospitals. The tables are made employing latest technology under the supervision of trained engineers. Offered at market leading prices, these are sturdy, durable and easy to maintain. The tables come with leakage proof hydraulic pump that is provided with double cylinder kept in central chamber. 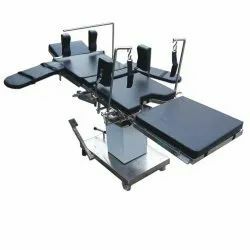 We offer Electric C Arm OT Tables with four sectional radiolucent top. With cover and base made of stainless steel sheet, the tables exhibit excellent resistant to corrosion. The tables are provided four castor wheels and floor locking system. Looking for Operation Table ?